Accessible directly from highways A13 and A84 and the Caen Nord Belt road, Hotel Première Classe Caen Nord - Memorial is in an ideal location for your leisure or business trips. From Hotel Première Classe Caen Nord - Memorial, you can get to sites including museums, landing beaches, the hospital, the tertiary area or downtown Caen within a few minutes. 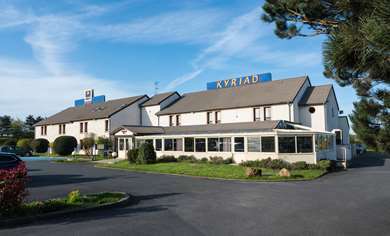 Hotel Première Classe Caen Nord - Memorial is the ideal place to stay while exploring the Lower Normandy region and its historical treasures, horseback riding and agrofood economies. The rooms at your Hotel Première Classe in Caen are designed to provide comfort and functionality. All rooms available for reservations are adapted to your needs: double bed, 2 single beds and/or and overhead bunk in some rooms. All rooms are equipped with a desk, shower and private toilet. or relaxation and entertainment, you can watch your favorite programs on TV or us the free Wi-Fi (1). Some rooms are accessible for the comfort of people with reduced mobility. 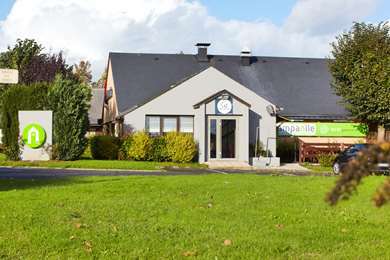 The rooms at your budget hotel in Caen offer the best conditions for comfortable, pleasant and efficient stay. The hotel also has connecting rooms for families. (1) In most hotels. In our Hotel Première Classe Caen Nord - Memorial, you can start the day off each morning with a balanced and varied breakfast buffet that includes products by major brands: 100% pure Tropicana orange juice, espresso, buns, fresh baguette, Breton bar, a choice of hot drinks... Everything you need for a good breakfast at only €5 per person Breakfast is half price for your children under age 10. We had a terrible experience here. Having stayed at the hotel a month before, we booked in advance knowing we wouldn't arrive until after the hotel reception had closed and having understood the system for retrieving the pass code. We arrived and entered our card details in the unit outside the hotel but unfortunately the machine could not print our room pass code. Unable to find an emergency number on the noticeboards at the hotel, we tried to contact the 24hr number available on the website but found they would not receive calls from UK numbers (prefixed 08). We contacted the general info number from the website which would accept UK numbers but were transferred to an un-answered answer phone. SO we were left without a room or any means of gaining access to the hotel itself. Knowing that the hotel was in the same group as Campanile, we drove to a local Campanile Hotel and asked their manned reception to contact the emergency number on our behalf. This proved hopeless and we ended up taking a room at this more expensive hotel (it was now 2300). We contacted the Premierre Classe complaints site that evening via email and notified them of our dissatisfaction. Imagine our surprise when, the following morning (after we had submitted our email complaint) we returned to the Premier Classe hotel (to have our breakfast) and there was a large laminated sign stuck to the side of the ticket machine with a UK accessible 24hr contact number clearly visible. When we checked at reception we were told that the laminated paper sign had been there the whole time, well colour me shocked! I am ashamed that both my wife's and my own eye sight was so poor the previous evening that we could not see this massive notice especially as it appeared to be so perfect in appearance, looking almost new and perfect in every respect. I should also apologise for my wife having seemingly forgotten the fact that she is a fluent french speaker and having become so dim as to not understand basic instructions laid out so clearly on this enormous and perfect notice. Clearly our making a complaint to the website the previous evening was a total waste of time as there was a massive, clearly noticeable, perfect laminated sign there the whole time. Anyway, we have been told, quite politely, by the hotel chain that we were not entitled to reimbursement of the abortive cost as there was such a massive perfect sign sellotaped to the side of the ticket machine the whole time. I must reiterate that this sign must have been there the whole time and was definitely not stuck there by the early morning staff following receipt of our emailed complaint and we are utterly stupid and at fault for not noticing this massive perfect new looking sign and opting, instead of looking carefully, to drive 5 miles out of our way and sleeping in a more expensive hotel, I can only apologise for my stupidity and would reiterate that I am stupid. I won't be stopping at this place or any of its subsidiaries ever again and I would recommend either eating worms or staying ANYWHERE (including sleeping in the car) over this chain. For a budget hotel it was fine and secure. Location was easy to find and had plenty of restaurants and a supermarket nearby. The room was adequate apart from the foam matteress that didnt really give a good nights sleep. Apart from that all ok and would stay again. Thank you for sharing your thoughts on your stay at our hotel. Cordially. Well it's not often I get upset about hotels. We paid for a basic hotel but it really was not upto much. The thing that got to me was we paid and the hotel was full, we even paid for a really basic breakfast. We tried to get our money back but absolutely wouldn't budge. I said well you could resell the room but no. The receptionist said it was company policy not refund and blamed shortages on booking.com for wrong description of room. We asked for a different room not near the lift. You know after an exhausting 6 hour drive we didn't need this. Never again. You really do get what you pay for !!! No hairdryer in room, one for the hotel. Hardly any food facilities. Totally upset. Thank goodness Brittany Ferries moved our crossing a day earlier. We have taken note of your opinion and we thank you for sharing it with us. Great location for visiting memorials and other war sites. Plenty of parking with a few restaurants within walking and distance. 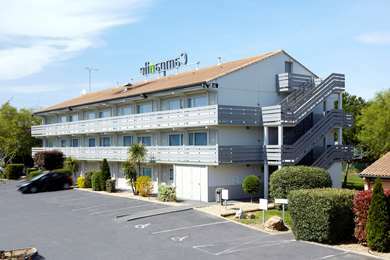 We used this hotel as a stay over whilst visiting Omaha beach and other war sites. Hotel rooms are clean and basic. I was quite suprised how good it actually was for a 2 star. No complaints at all. Beds was very comfortable and I had the best sleep in a long time. However, an 8 hour drive prior may have been a contributing factor to such a refreshing sleep. I would definitely use this hotel again. Hello, we are delighted that you enjoyed your stay in our new generation hotel. Cordialement. First visit to Premiere Classe Hotel but will definitely use again. We stayed after arriving in Ouistreham on a late evening ferry and needed somewhere close to Caen and easy to find. The hotel provides a simple room which was spotlessly clean with a good shower and comfortable beds. The continental breakfast (extra charge but value for money) was simple and offered plenty of choice in a very clean breakfast room. Parking is on site and felt safe. Recommended. Thank you for sharing your vision of our hotel, we are delighted that you enjoyed your stay at our new generation property. It will be a pleasure for us to welcome you again.